This is the third article in our series of blog posts on notable updates from the requirements management (RM) tool market that happened since September 2014. It features updates concerning Blueprint. Since our last update Blueprint delivered the 6.0 and 6.1 on premise versions. 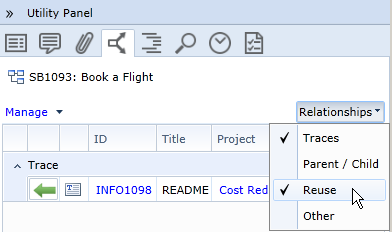 Release 6.0 focused on requirements reuse capabilities. Reuse of requirements boosts efficiency and quality in the product and project delivery process. Therefore, we see the reuse topic as a major trend in this decade. We already covered this topic in depth in a webinar that focused on reuse. Improved discussion: Now all users who commented a specific requirement are automatically included when someone posts a discussion. E-Mail users can be anyone (not just Blueprint users). Requirements reuse: Version 6.0 introduces reuse capabilities for requirements. Requirements can be reused across projects. Tracking of reused requirements is managed by a specific relationship type: “reuse relationship”. Blueprint provides visual information if source and target are no longer in sync. It also provides functionality to reconcile requirements across projects. The functionality is nicely presented in this Blueprint Video clip. Collections: With the newly introduced concept of Collections as set of requirements can be easily grouped and managed together as a single unit. Excel update: Prior to release 6.0 it was possible to import from excel. With the new functionality requirements can be exported from Blueprint to Excel, edited in Excel and re-imported again. Blueprint does not generate a new requirement but updates the existing one. Other RM tools call this functionality “round-trip” support. Accelerators: Accelerators are downloadable packages that support particular standards, processes, or software development approaches. Accelerators are intended to save time for those configuring Blueprint to suit particular processes used on their projects. Blueprint plans to deliver accelerators frequently. The first accelerator is an “Agile Accelerator”. Detailed information about those releases can be found at blueprints website: 6.0 info, 6.1 info.